My first invitation to ride with a squad came in 2003 and was extended by firemen Corey Hojek, who was introduced to me by Chief Robert Hoff. My deepest thanks to both of these men who were kind enough to understand what this project was/is about. Squad 5 fireman Brian Valez with K12 mettle saw. 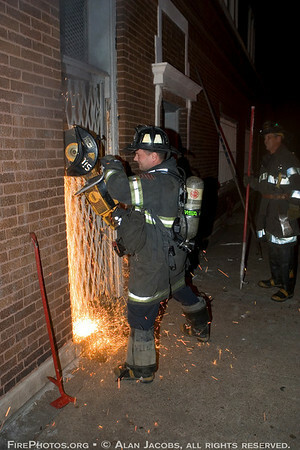 It looks like a variation of a Halligan Bar. From Wikipedia: "A Halligan bar (also called a Halligan tool or Hallagan, and is often referred to as a Hooligan Tool in various Australian fire services) is a special forcible entry tool commonly used by firefighters and law enforcement. It was designed by and named after Hugh Halligan, a First Deputy Fire Chief in the New York City Fire Department, in 1948." I have seen it used in a variety of ways: to pry open all kind of doors, car, homes etc, to poke holes in wallboard and then pull, to seek out hidden fire. Generally every truck in the CFD has one, or rather one or more of the guys on that shift has one as they are purchased by them and are not, as far as I know, equipment.